Stitching Feeds My Heart [E6803] - $10.00 : Yarn Tree, Your wholesale source for cross stitch supplies. Cross stitch pattern by Silver Creek Samplers. 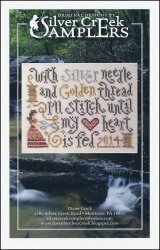 The verse "With silver needle and golden thread I'll stitch until my heart is fed" is accented with spools of thread and a woman with scissors. Stitch count 79 x 30.